If you're seeking value in the oil and natural gas sector, Hi-Crush Partners, Kinder Morgan, and ExxonMobil should be on your short list. Oil has been simultaneously one of the more interesting and challenging sectors to invest in over the past few years. The effects of the oil price slump that persisted from 2014 through 2016 continue to ripple across the sector, and they've led many investors to shun the industry. Yet while crude oil prices are on the rise, many companies still trade for rather attractive valuations. So we asked three of our investing contributors to highlight an oil industry stock they think is worth a second look today. Here's why they picked Hi-Crush Partners (NYSE:HCLP), Kinder Morgan (NYSE:KMI), and ExxonMobil (NYSE:XOM). Tyler Crowe (Hi-Crush Partners): When the shale oil boom was getting started five years ago, it seemed like Wall Street couldn't throw money at frack sand suppliers fast enough. Shale was the "it" thing, and high projected demand for sand meant suppliers were spending wildly add to capacity. When the oil crash hit, though, sand demand dried up quickly as producers became less eager to drill new wells, which led to a lot of excess capacity, weak margins, and overleveraged balance sheets. Hi-Crush Partners was one of the hardest hit. Its debt load ballooned to unsustainable levels, and management was forced to cut its payout and issue new shares at incredibly low valuations to meet its cash needs. Based on that recent history, I can understand why some investors might shy away from its stock. If you are willing to put the past behind you, however, you'll see that the company actually looks attractive right now. Demand for frack sand is on the rise, and Hi-Crush's mines are running at high utilization rates. It has expanded operations in the red-hot Permian Basin, and its last-mile logistics offerings are improving its margins on every ton sold. All of these elements have allowed it to significantly repair its balance sheet; the company has returned to paying a sizable distribution, and is even starting to buy back shares to reverse the dilution it resorted to previously. The oil price crash compelled both producers and companies serving the industry to become more prudent about capital allocation and financial management. It appears that Hi-Crush's management is taking the hard lessons it learned during that slump into this boom cycle. There is always a chance that sand prices could swing wildly in response to shifts in oil and gas demand, but it appears that if they do, Hi-Crush will be in a better position to handle it. Travis Hoium (Kinder Morgan): Kinder Morgan is one of the leading pipeline companies in the United States, transporting more petroleum products than any other independent operator, and moving 40% of the natural gas consumed domestically. What I like about Kinder Morgan is that it's less dependent on oil and natural gas prices than most companies in the sector. Its business is focused on fee-based transportation, with 66% of 2018 EBDA (earnings before depreciation and amortization) expected to come from take-or-pay contracts. In 2018, management expects the business to generate adjusted EBITDA of $7.49 billion, with distributable cash flow of $2.05 per share. Given that its current dividend is $0.80 per share, that suggests it will have ample room to grow its payouts over the long term. Management expects to generate excess cash flow of $568 million in 2018 alone, which could be used to pay down debt or fund growth. Kinder Morgan's enterprise value of $72.4 billion is 9.7 times expected 2018 EBITDA, which I think is a reasonable price for a company well positioned to take advantage of long-term growth in oil and natural gas consumption in the United States. From a dividend perspective, the stock yields 4.9% at the current price, which is a strong yield for investors bullish on the sector, and based on management's projections, they will have plenty of opportunity to boost the dividend in the future. Reuben Gregg Brewer (ExxonMobil): ExxonMobil is one of the world's largest integrated oil companies, with a portfolio diversified across the entire oil and natural gas value chain. Its peers' stock prices rose over the last year as higher oil prices boosted their financial results. ExxonMobil's stock price, however, has fallen. 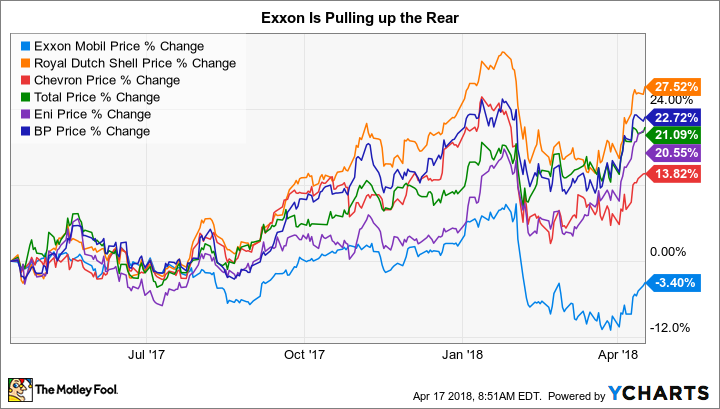 There are some valid reasons for this, among them that ExxonMobil's peers caught up to its usually industry-leading return on capital employed numbers, and that the energy giant's production fell in recent years. However, these are likely to be temporary issues: It recently presented plans to boost its return metric from the single digits to the mid-teens, and it's working on key production-boosting projects onshore in the United States, as well as offshore from Mozambique and Guyana. The problem is that Exxon is a giant ship that takes time to turn. But that's also why there's opportunity here for investors who think long term. Short-term concerns have pushed ExxonMobil's price-to-tangible-book-value ratio to low levels not seen since the 1980s. Its yield, meanwhile, is around 3.9%, at the high end of its historical range. But Exxon remains one of the most conservatively run oil majors with an incredibly strong balance sheet (long-term debt, for example, only makes up 12% of the capital structure). If you don't act soon, you could miss the chance to collect a big yield while you wait for management to complete its plans.